We certainly have quite the treat for you today, readers! There’s a chance you might have missed our previous coverage of Hero Master: An Epic Game of Epic Fails. Well, we’ve had a lovely chat with its creator. Jamie Noble Frier who has designed, illustrated and more or less conceived the entire game was wonderful enough to answer some questions for us. What is Hero Master: An Epic Game of Epic Fails? In the board game Hero Master: An Epic Game of Epic Fails you play the worst heroes in the land of Snoozehaven. As the last picked for every party you have reluctantly resigned yourself to banding up with the other remaining nitwits at the tavern. All towards a last effort to prove yourselves to the legitimate adventuring parties. There’s a dragon’s hoard you’ve heard about, a haul like that might be just kind of respect you need. You sure as heck aren’t going to share it though! 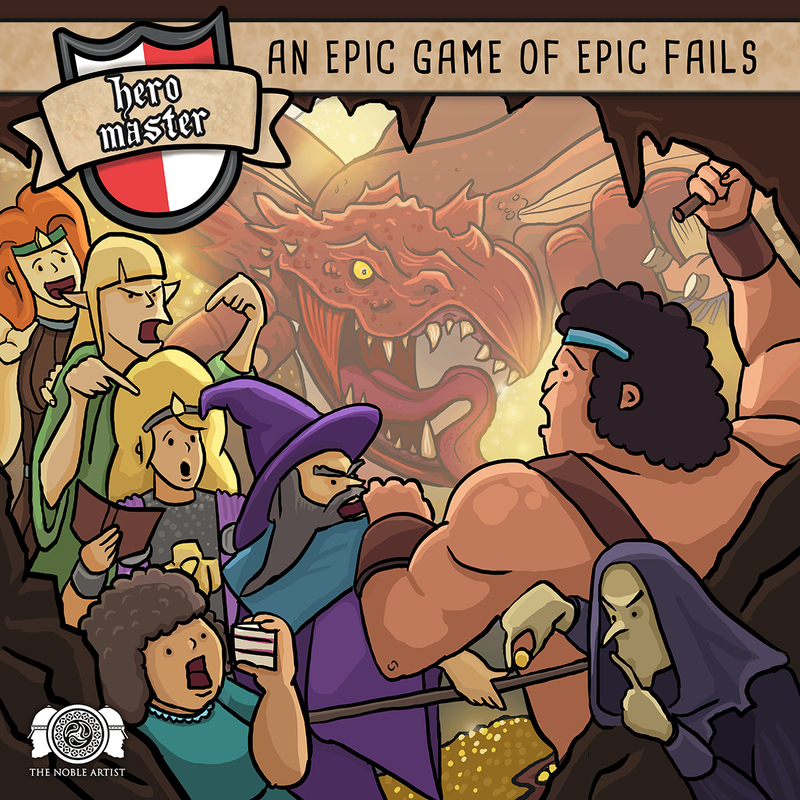 Hero Master: An Epic Game of Epic Fails is NOT a co-operative game, you can’t stand the fools you’ve banded together with. You and the rest of the party are convinced you’re each above all this and just can’t wait to get the gold. With or without them! You’ll be squabbling to be dubbed Party Leader to ensure you get to make all the decisions that benefit you. All whilst trying to fumble your way to defeating monsters, and bungling the attacks of your fellow ‘heroes’. There’s a lot of hand management, tactical card play, take-that and fast dice play. This is all wrapped up in the heart-warming humour found in the card art and flavour text. Combined, these all really paint a picture of these hapless heroes. Who are you and what is it you do for the game? I’m the designer, artist, graphic designer, writer and just about everything else on the project. I’ve run The Noble Artist alone for almost ten years now and for the majority of that time I’ve been producing art for other designers and publishers of board games (books and video games too). Hero Master: An Epic Game of Epic Fails is my first production of a game alone. I love games, particularly fantasy games, and enjoy a mix of Ameritrash and Euro depending on my mood. Currently popular both solo and in my game groups are Gloomhaven, Sword and Sorcery, Scythe, and Powergrid. Mage Knight will always have a special place in my heart though, also Talisman really “gatewayed” me on to a lot of other games (having been a Games Workshop games player in my teens). From where did the idea of the game originate? Perhaps something that started as a somewhat daft idea that spiralled out of control and into success? I often look back nostalgically at fantasy games I’ve played, none more personal than Dungeons and Dragons campaigns as it’s all ‘you’ (also I binge on the nostalgia of Games Workshop titles, still kept the army books). Hero Master came from turning those fantasy tropes upside down, partly from my silly imagination getting carried away with me, but also from experiences of our ineptitude as adventurers. I thought, “wouldn’t it be fun to centre a game around those heroes that constantly botched every dungeon”. It’s like the time your DM suggested rolling arbitrary stats for your class and trying to bungle your way through a campaign. Rogues with no dexterity and Wizards with minimal intellect pretending to know what they are doing. It was a lovely surprise to talk to people about the premise of the game, and have so many of them say “sounds like our Thursday night” or something similar. Who is Hero Master for? Experienced board-gamers and tabletop fans? Fresh-faced youngsters yet to fall head-first into the genre? Maybe a balance of both? I’m not going to say it’s a game for everyone and cliché myself to death… However, don’t be fooled by Hero Master’s humorous veneer. The major takeaways from previews have been its hidden depth of gameplay. It’s got some meat on the bones and will satisfy gamers who want a more than a slapstick romp. The tactics in the first round of each encounter involve jockeying for Party Leader (first player) with your cards. However, ensuring you have the right attack on the right monster makes the game a battle of wits. It all also helps to induce some great banter around the table. That’s what’s been important to me. I love games in which I burrow deep into silent thought while playing with other people (Scythe, Mage Knight and other favourite games). Yet, for this I wanted to bring some lively interaction to the table that’ll make people talk to one another. The game has an insatiably bizarre competitive twist on a cooperative setting. How did this idea first come about? What inspired you to have this be the crux of the gameplay? I love the idea of selfish guys that just happen to be adventurers. They’re not “Lawful Evil” or anything, they’re just idiots. Get a whole group of them together and you’ve got a perfect storm of desperation and calamity. I love dungeon crawlers, and wanted to make my own (one day I’ll make something serious and epic!) but this was a nice way to add a fresh spin to the genre. Are there any existing games or products that inspired Hero Master? What other games are comparable, if any? If I enjoy those, will this tick most if not all of my boxes? Inspirations for Hero Master would of course be Dungeons and Dragons. It’s a definite homage and parody of it and RPGs like it. There’s a Monty Python and the Holy Grail connection there too, where the heroism and glory of these renowned knights are called into question. In terms of board game comparisons, I wanted to keep the D20 rolling as another homage to DnD. The card management may be a little reminiscent of Blood Bowl Team Manager, in that you have choices as to where to commit yourself. There’s a bit of character creation which you’d find in a lot of games in the dungeon crawl genre, but it’s mashed together similar to the game Smash Up. I think the key aspect of the game is the Party Leader mechanic though and although some games (Agricola) have methods of usurping the leader, Hero Master has much more back and forth. I think as it takes elements from those (quite different) games, it forms quite an interesting take on a very established genre. Hopefully a new experience for veteran gamers and a light-hearted look into deeper mechanics for those progressing in the hobby. The humour in the game is arguably its biggest appeal, I’d say. Is it safe to presume this was pivotal as part of the design/conception of the game? The humour started out as a series of greetings cards that still exist today called Hero Master: Critical Fails. This kind of formed an art and humour test for the game. People really like them in the RPG/board game crowd, so I felt confident developing the idea. I had a game in mind where a party of heroes would be set against one another and this really fit the bill. For me the humour of the game helps to offset the “take that” element. It also helps to add a juicy theme to the game. With the mini stories on each card, I wanted to give the fluffy warm feeling of nostalgia for fantasy I get when I think back to playing those moments in RPGS and other fantasy games. It’s been lovely getting such positive feedback about the humour in there; I can imagine the fear of a comedian bombing on stage having written the cards. How difficult has the experience been going from concept to crowdfunding? I’ve seen the game at a show and it certainly looks like a lot of hard work has gone into it. The work never stops when crowd funding, especially working alone. The concept has been in my head since I worked my first job in video games. We began getting deeper into board games at lunches and during evenings, probably around nine years ago. The game wasn’t really explored more until about three years ago. It’s been through a lot of iteration, changing quite radically throughout. The Party Leader mechanic was a real stand out moment for me, solving play test issues and actually becoming my favourite aspect of the game. As the artist too, I was spending a lot of time doing the artwork, and redoing the graphic design over and over. It took far longer than it should have. There are so many things I’d do differently next time. I was foolish enough to think that once the assets and gameplay were done, that things would get easier. However, as an artist and creative, those were the easiest. Getting my head around the business side has been a much longer but thoroughly satisfying experience. I love learning about that side of it now, and although it may take me longer to absorb, it’s become my new obsession. That’s the sort of thing that’s not quantifiable on the Kickstarter page, or the final product. You can see the components and art, and talk about gameplay, but it’s the learning that’s gone into making sure I have marketing in place, the right maths for the RRP and shipping, all that other stuff which has kept me busy. What’s your favourite race/class to play within the game and why? My favourite class would probably be the Wizard, due to the neat perks of the action cards, and it has the most fiddly combo that if it comes off is awesome! Couple that with the Halfling so you can slip through the monsters legs and avoid attacks (the wizard being so squishy) opens up a lot of doors for bold and brazen moves! Do you have any advice for those wishing to dive head-first into creating board games or tabletop games with crowdfunding in mind? Any major do’s and dont’s? Research the industry like crazy. It will save you money, headaches and you’ll meet great people in the process. You’ll find nearly everyone says the same thing, but read all of James Mathe’s blogs and Jamey Stegmaier’s blogs. Join forums and Facebook groups for advice. Make sure to search those places for your answer before asking. Despite the fact the industry is incredibly helpful, it can come across as lazy if you don’t want to dig in yourself (don’t worry everyone is new at some point, I have definitely asked pre-answered questions in the past). Build an audience before launch. I can’t verify this as I haven’t launched yet, but having experienced how hard it is to engage people to gather emails and interest, you need to start this early. I’m fortunate I spoke to guys in the industry early on about this. Help other people, teaching helps you learn. Go crazy making fancy graphic design while you’re still working out the mechanics. The two are intrinsically linked, and will change. It’s a much longer process when you’re having to rejig every card because you’ve made a minor rule change. It may even feel like it’s not worth changing rules to fit your card design. However, this will result in a worse game. I designed mine early and changed it SO many times, I wouldn’t do that again. Get upset when things go wrong. This is advice I still need to listen to, it’s hard to pour yourself into something and get knocked. It’s all a positive experience in the long run. Especially when you start to publicise things, that’s when cracks can appear. Whatever happens remember that you’re potentially providing a product, you need to be professional. Listen to one person, always gather more information before making major changes. When can players expect to get their hands on the game and how can they get it? Thanks very much to Jamie for his time and insights. We hugely appreciate him lending his experience to our eyes/ears and wish him the best of luck with the kickstarter. As always, stick with us on Facebook for all the latest updates and news on anything tabletop.